1.In small bowl, whisk garlic, barbeque sauce and 1/2 cup water. In 5- to 6-quart slow cooker, add pork; pour barbeque sauce mixture over pork. Cover and cook on high 4 hours or low 8 hours or until pork is very tender. With 2 forks, shred pork in slow cooker. 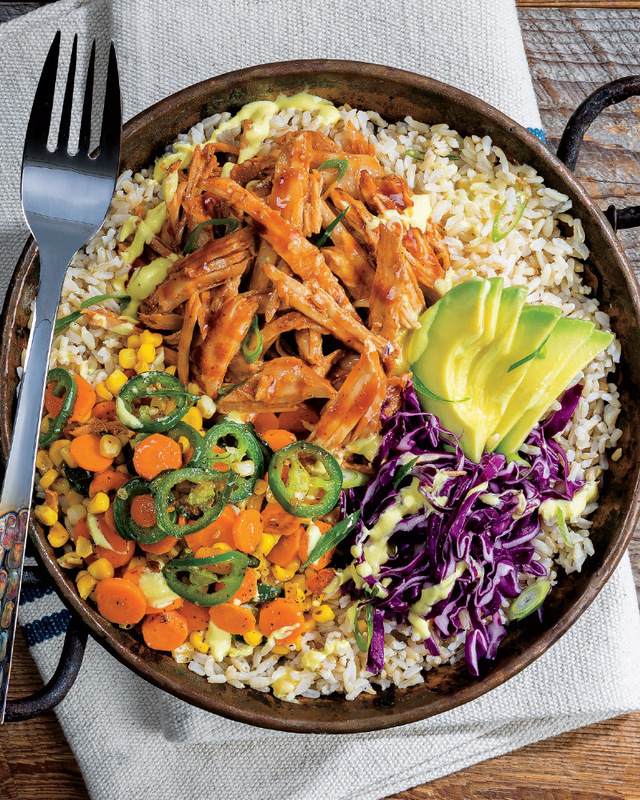 4.Divide rice into 4 bowls; top with onion, avocado, cabbage, pork mixture and roasted vegetables, and drizzle with yogurt mixture. > Shop for a microwavable quick cooking whole grain in both the grocery and frozen departments of your local Martin’s. One of my favorites is Seeds of Change Brown Rice and Quinoa blend found in your grocery department near all other rice varieties.